What is the meaning of hand drawing today, particularly when many of the things drawn, are inspired by digital creation? What does the way we do something say about the end result? Is it meaningful to make analog representations of digital creations and generations? In thinking about these kind of techno-artistic issues, I think it is paramount to not only look at where we are, but also at precedent. While we struggle to find meaning with our makings, it is important to consider that this is not the first time that this kind of issue has come to the fore and most certainly will not be the last. As the use of technology changes the meaning of our work, I am always reminded of John Ruskin. Though I certainly cant agree with all of his motivations or conclusions, Ruskin's methods and results produced some truly timeless studies and insights. This is perhaps, my favorite diagram, illustrating the commonalities of natural form, between mountain and branch, wave and shell. At the same time, his world was being transformed by industrialization, and the meaning of art was being challenged by mass reproduction and mechanization, and it became increasingly difficult to find meaning in producing by hand when the results of machinery can be infinite and infinitely precise. "'Abstract Lines.' John Ruskin. 1856 or 1857. 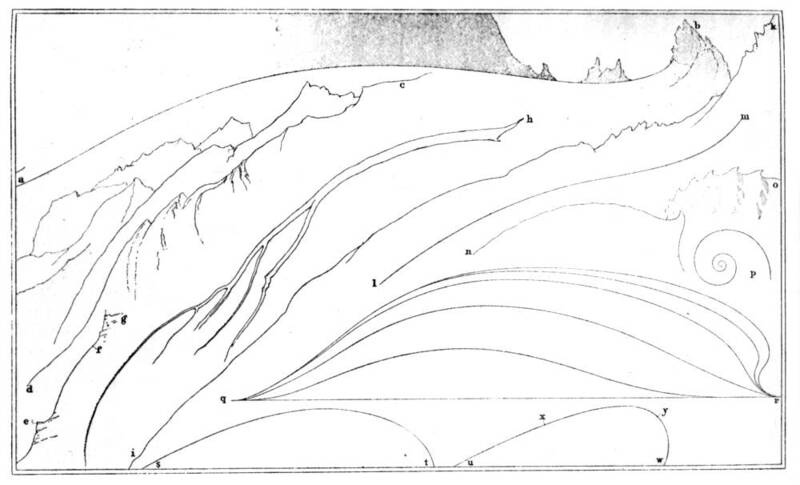 This drawing served as an illustration to Volume l of The Stones of Venice (1851) to demonstrate that architectural ornament should be based on the abstract lines derived from natural shapes, a-b: the curve of glacier near Chamonix; d-c, e-g, i-k: curves in mountain ranges; h: a branch of spruce fir; 1-m, q-r, s-t, u-w: leaf shapes; n-o: the lip of a snail shell; p: a worm spiral. See 9.266-9." In the spirit of Ruskin's diagram and theory of natural abstraction as the basis of ornamental beauty, and beauty as an objective quality derived there-of, I decided to follow his strategy of using abstractions to represent naturalism, while at the same drawing from the concept of the grid and weaving, as weaving and textiles were the foundation of the industrial economy and the transformations that influenced Ruskin's work.